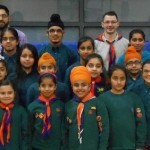 A big heartfelt thank you to all the children and helpers at the 13th Slough Sikh Scout Group for their generous support of SHOC. The group held a Charity Quiz evening on Dec 18th 2013 in which Beavers, Cubs and Scouts took part in teams with their parents, friends and relatives. The proceeds were split equally between SHOC and the United Sikhs, (a humanitarian relief aid organisation), who were helping with the Phillipines disaster.